One sunny weekend while deliberating where to venture next on our travels, we happened across an on-line travel article about the Azores; a group of islands in the middle of the Atlantic some 1400 km from the coast of Lisbon, but classified as an autonomous region of Portugal and therefore part of the EU. We read on. And decided that we were sufficiently fascinated by the Azores to create a September backpacking holiday which would take in a couple of these intriguing islands. We arrived late Friday night, in Ponta Delgada on the south coast of the Azores main island, Sao Miguel. Ponta Delgada is the largest town in the Azores, and has a regional airport which serves several international airlines including newly scheduled flights from budget airlines Easyjet and Ryanair. Suddenly, the world is waking up to what these Azorian islands are offering. With an agreeable balmy climate through the summer months interspersed with dramatic rainfall, the islands are lush, green and with abundant flora – contrasting beautifully against the harsh black volcanic rock which dominates the island landscapes. The islands boast amazing wildlife, thermal pools, volcanic lakes, mountains, beaches and clement weather. We wanted to spend a couple of days in PD before heading out around the rest of the island and getting to grips with the more rural areas. We also wanted to book onto a whale watching tour – the Azores are renowned as one of the best places in the world for cetaceans. Some 25 species of whale and dolphin have been sighted in these waters, with the Sperm whale being the most common. We flew to Lisbon from Bristol with Easyjet – Easyjet have launched low cost airfares direct to the Azores but for us, flying from Bristol is our preference and no direct flight path there as of yet. So we then hopped on a Ryanair flight from Lisbon to Ponta Delgada for the bargain price of around £30, and with a great connection time. We landed in PD just before midnight. A quick taxi to our hostel from the airport meant that we were sitting in our little courtyard drinking Duty Free spiced rum by 12.45, listening to cicadas in the still-balmy night. We booked into the Vintage Place, which was a fabulous choice and driven by the fact that it offered a shared kitchen facility. Now John being vegan means that travel to some parts of the world, and especially Europe is a challenge. Even vegetarianism isn’t fully embraced in some areas, let alone veganism. And of course the islands here are diet rich in fish and sea food. So having a little self-catering option is always good as back-up. 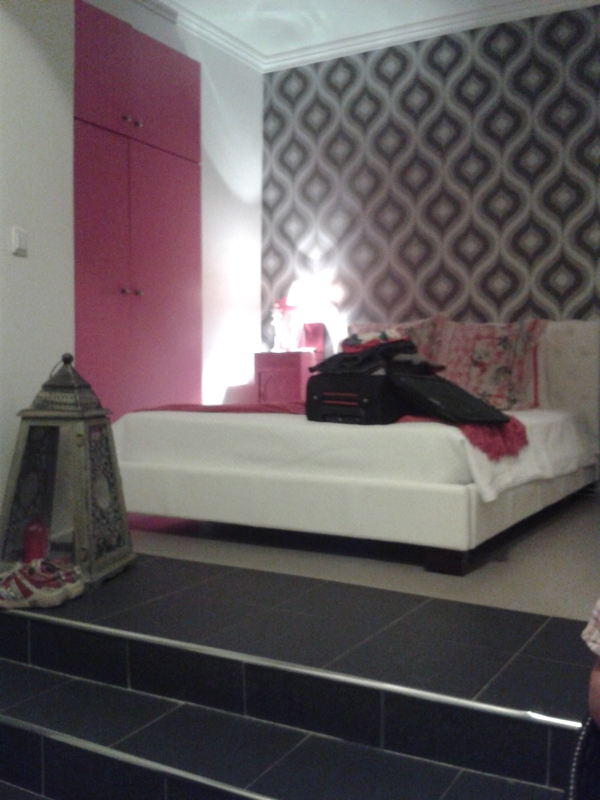 But the Vintage Place was an ideal compromise for a few nights – a 5 minute brisk walk (or a short-legged lollop in my case) from the centre of town, and a private ensuite double with use of the well equipped kitchen was 40€ a night. It was spotless, bright and cheerful. 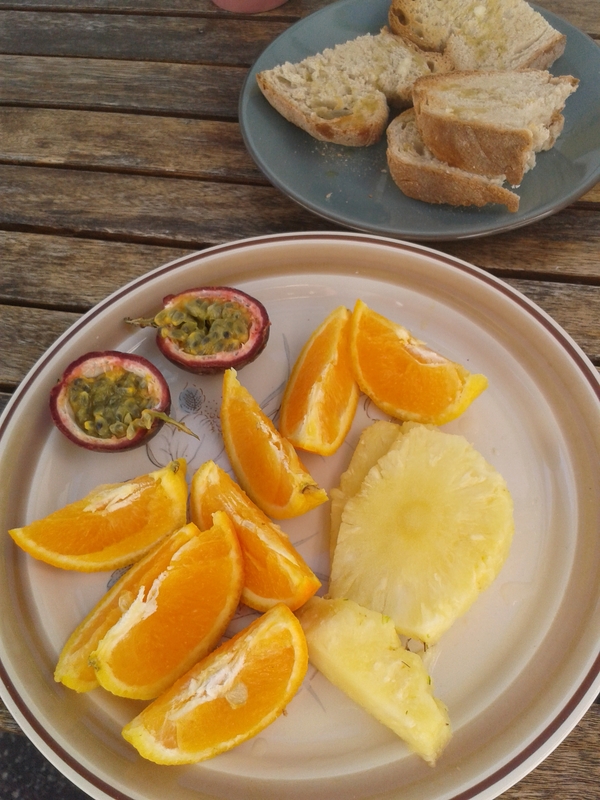 We bought some lovely local fruit for breakfast (the Azores produces pineapples among other things) and bread rubbed with garlic and olive oil. Ponta Delgada is not party central. And thankfully so, some will say. In fact the island, as well as the city, is a little like re-winding Europe by about 20 years – just better than that. It has technology, it has a healthy economy (growing due to increased tourism) it is modern – but it has a slowness and tranquillity that frankly, is a relief if escape from a hectic pace is what you’re looking for. Some might find it a little too quiet – a couple from Holland we met were lamenting the absence of late night music. Sure, there are scheduled live performances all through the city of music and theatre, but this is not a nightclub hotspot. There are a good selection of shops, bars and restaurants and interesting architecture, monuments, churches and municipal buildings. 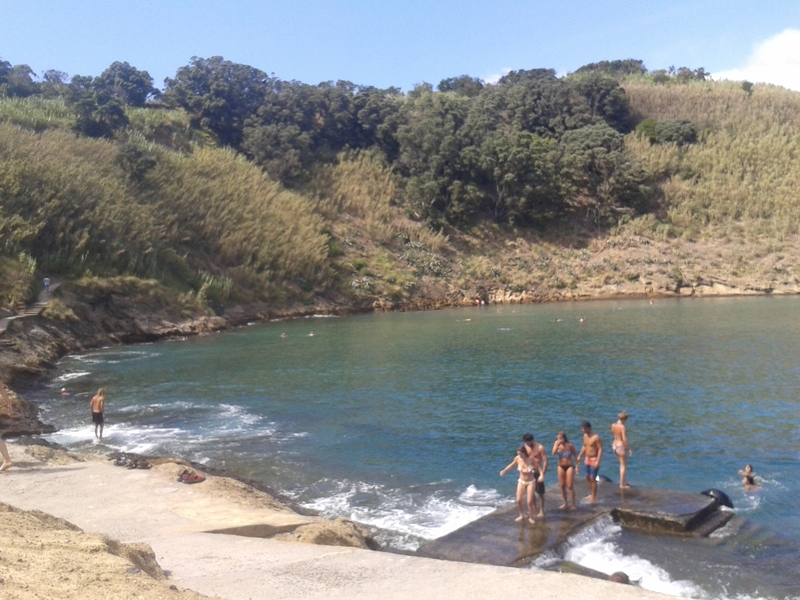 A natural swimming pool is sited to the east of the harbour. We enjoyed a day meandering but felt that was probably enough, maybe we could have filled a second day at a push. With lots and lots of cafe and bar breaks…..Food wise we had an OK meal on the first night, having been disappointed not to have been able to get a table at the Azores one and only veggie restaurant, Rotas Da Ilhe Verde. Advice here is to book well in advance! For the second night we found Arriba, a mexican restaurant, by sheer chance. Their menu promoted vegan options so this was a good serendipitous choice and the meal was great. Our whale watching tour was on Sunday and we used Futurismo tours, based on their great Trip Advisor reviews and their ethical management of sightings. We combined the morning tour with an afternoon visit to the volcanic crater lagoon, Vila Franca islet. Vila Franca islet is situated around 1 mile from the coastal town Vila Franca, and is a dormant volcanic crater which just pokes it’s head above sea level to form an almost perfectly circular swimming lagoon. It is protected, and a maximum of 400 visitors per day are permitted. But once there, it is a little piece of paradise, albeit quirky. The lagoon is bordered by volcanic rock, making entrance to the water a little tricky – it’s more of an ungainly slither onto slippery rocks, but once in, a shallow swim can be had. The lagoon averages a depth of 1-2 metres with about 3 metre max depth in some areas. It was heavenly. Anyway, I’ve fast forwarded there – the morning was all about the whales. We boarded the Futurismo boat at 9am after a short training video and set off. When I say set off, I mean we veritably jetted off – sitting at the front and with the boat hurtling at high speed across some very bouncy waves, it was as much as I could do to stop squealing with delight and demand the captain ‘go faster, faster!’ Brilliant fun. Got absolutely soaked too. Whale sightings start from shore, with several strategically placed lookouts along the coast line directing boats to sightings of blow holes and pods of dolphins. We scoured the ocean looking for these elusive creatures and ended up amidst a huge pod of common dolphins, a really wonderful experience. But the whales were evading us, and alas we missed out. Never mind, we’re going to have another go sometime. The tour included a lunch at Vila Franca, which was pretty good. Fish and salad, drinks, bread and local cheese. John had salad and potatoes, an easy vegan option but he enjoyed it nonetheless. The two days we had in PD were very hot – more so than we expected, and sunscreen was a must. Temperatures reached around 27 deg. So we said goodbye to Ponta Delgada yesterday and set off onto the next leg of our travels exploring the rest of this wonderful island. More updates to come!